In this article, we will list down the download links for all the the latest service packs of Microsoft Office including Office 2000, Office XP, Office 2003, Office 2007, Office 2010 and Office 2013. But before downloading, lets clear out some concepts. Microsoft service packs are updates to their current products which include all the fixes and updates from the last year. In addition to the fixes, the service packs also include certain new features to enhance the functionality of the product. Service Pack is usually abbreviated as SP. Which Service Pack is installed currently? 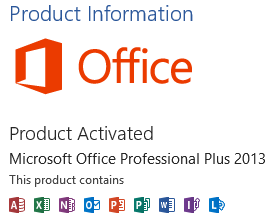 You can see the service pack installed with Office by going to Programs and Features and View Windows Updates. This will take a little finding. Alternatively, you can open any Office program and go to File Menu –> Account. This will show the version of Office and service pack installed on your system, if any. We will be updating this list regularly whenever a new service pack of any Office product is released. We will also write about the new update separately. So you can always subscribe to our newsletter for knowing about each update separately. If you find this article outdated, kindly let us know through comments.